This classic French dish usually calls for an abundance of different types of meat, of course my version is plant based. 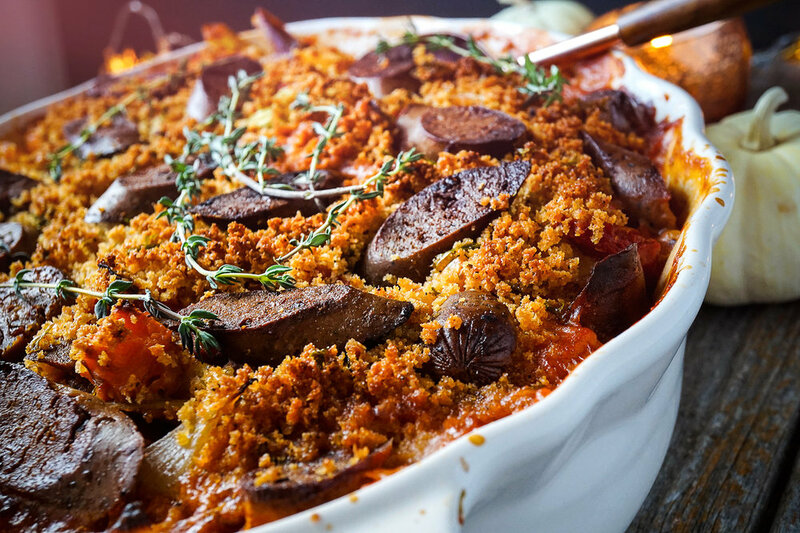 It's a warm and comforting meal, full of seasonal vegetables and delicious smoked apple sage vegan sausage. Perfect for big gatherings! In a large deep fry pan heat a few swigs of olive oil and heat for a minute or two on high then lower to medium-high and add the potatoes and butternut squash. Season with salt and pepper and saute for 5 minutes and transfer into a large mixing bowl. Add bit more olive oil to the fry plan if needed and toss in the carrots, celery and onions and saute for 5 minutes. When they're done add them to the potato mixture. Lower the heat to med-low and toss in the stewed tomatoes, cannellini beans, porcini mushrooms and the 2 cups of liquid. Simmer for 10 minutes and then add in 1/2 cup of breadcrumbs. Simmer for 5 more minutes. The sauce should reduce and thicken a bit. Transfer into vegetable mixture and gently stir to combine. Diagonally sliced the sausages into bite size pieces and and fry for a few minutes to brown both sides. Pour the casserole filling into a lightly oiled large casserole dish. Fold in half the cooked sausage. In a small bowl, combine the melted butter, 1 cup of breadcrumbs, 1 tsp of thyme and parsley, and 1/2 tsp garlic powder. Evenly spread the crumb mixture on top of the casserole filling. Place the remaining sausage pieces on top. Bake for 45 minutes, or until brown and crispy. Serve and enjoy!